Barrette's Small Engines Inc - SmallEngines.ca Website Ontario Canada! We invite you our valuable customer to look through our Canadian website which is filled with parts for Briggs and Stratton, Honda, Husqvarna, Kawasaki, Kohler, Subaru, Tecumseh engines and many more products! Our website is being updated on a WEEKLY basis. See what we are about and have to offer you. If you have any questions or concerns, please do not hesitate on using our contact us page! 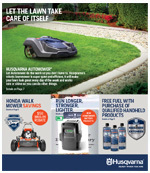 Check out Husqvarna's 2018 Spring Flyer!